Have you ever seen a ghost? Are you sure it wasn&apos;t just a balloon with a face drawn on it? 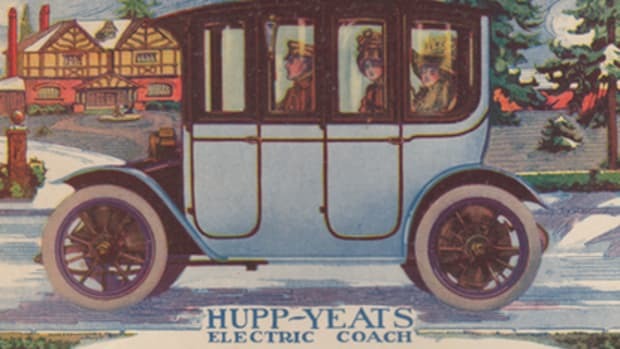 With the slow and steady rise of household electricity in the early 20th century, spiritualists and mystics had new tools to convince people that they were able to communicate with and conjure supernatural beings. 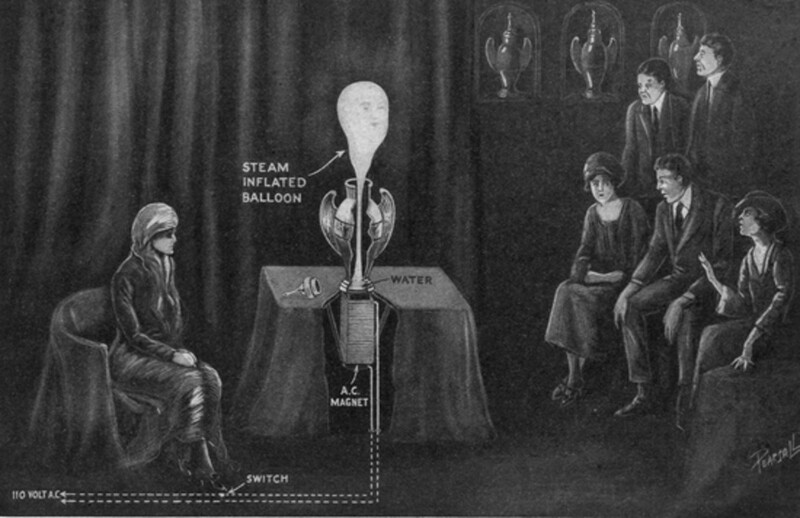 Skepticism was a prominent theme in the electrical hobbyist magazines of the 1910s and &apos;20s and writers who knew about how to create seemingly magical phenomena with electricity took a lot of pleasure in showing off how these tricks worked. 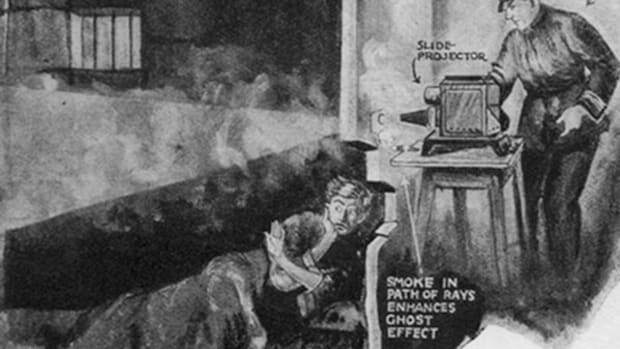 The pages of magazines like Science and Invention, Electrical Experimenter and Practical Electrics were filled with articles explaining how the pseudo-supernatural effects were achieved, and how you could make them right at home to impress your friends. 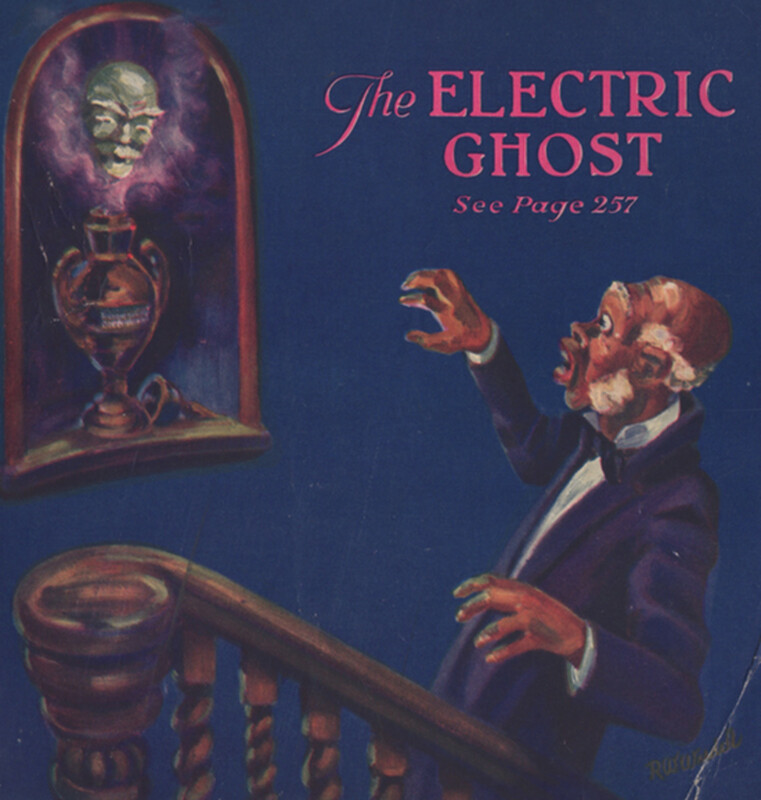 The April 1923 issue of Practical Electrics magazine showed how to make your own "electric ghost" in an article by Clyde J. Finch. In the article Finch described a recent seance he had attended. He entered a large dark room where people then gathered around a table covered in black cloth which reached the floor. Urns sat in recessed parts of a wall and black velvet drapes hung over the windows and door. When the medium entered she placed an urn on the table and the writer describes trying to peek inside, but seeing nothing because the room was so dark. I glanced back at the urn, and behold, from the mouth of the urn a misty white form slowly arose. I watched this apparition as it gradually grew into the form of a man&apos;s head, with plainly distinguishable features. The face appeared as pale as death itself, and seemed to emit a mysterious phosphorescent glow. Suddenly the death-like silence was interrupted with a BANG ! The ghost disappeared in a white cloud. We sprang from our chairs and rushed for the door, and in my haste I bumped the table and tipped over the urn, out of which ran a stream of steaming water. I realized then that the ghost was a fake and produced by scientific means, and all my fear and creepy sensations departed. The medium then grabbed the urn and Finch describes her as rushing out of the room. He turned on the light and raised up the black cloth which was covering the table to discover how the ghost had been produced. Finch explains what he saw, which included a magnet, tubes connecting various compartments and her method of heating water which caused steam to inflate the balloon head —before it popped at least. Finch describes the balloon as probably being specially made with certain features rather than simply being a cartoonish face drawn on a regular balloon, which was my first thought. A large magnet, about 18 inches long, was securely bolted to the under side of the table. The core of the magnet was about 3 inches square in cross-section and was made up of transformer steel laminations tightly clamped together. The wire on the core appeared very large, about number 6, and was wound in three layers. Evidently the magnet was designed for use on a 110-volt circuit. Just what was in the urn I never discovered, but the illustrations show the method probably used. The urn was of bronze, its interior divided by a diaphragm across it just above the base; the bottom compartment was soldered and held water. A tube connected the two compartments, in the upper one of which was fixed a thin rubber tube terminating in a rubber balloon. 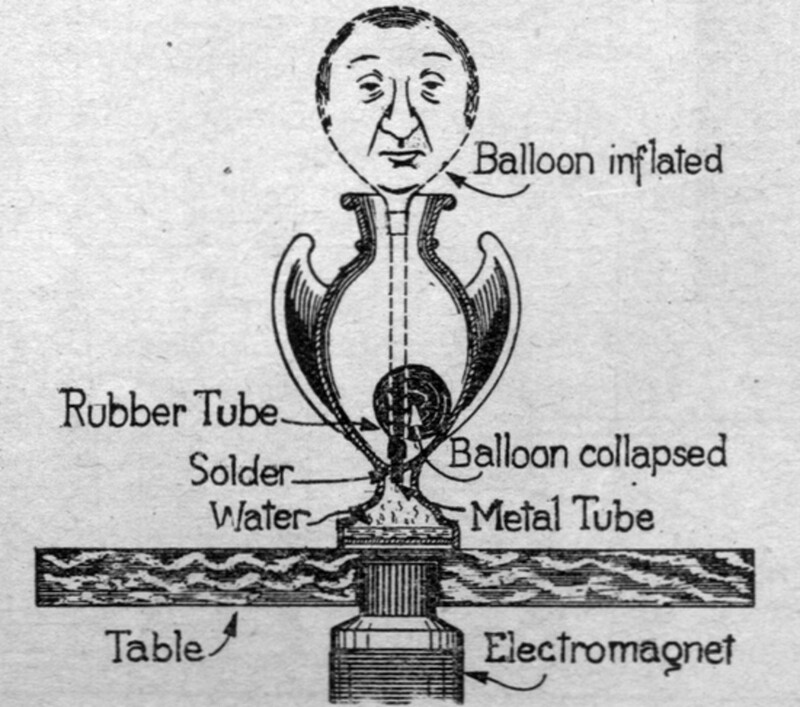 Normally the balloon and tube are rolled up, but when the urn is placed over the magnet through which an alternating current is passing, the heavy currents induced into the bottom of the metal urn generate enough heat to boil the water and inflate the rubber tube and balloon with steam, which unroll and expand and are forced out of the urn. The medium probably used a special balloon, as the features of the face, such as the nose, appeared to extend out like reality and were not painted on the rubber. However, a plain balloon with a painted face, tinted with radium luminous paint, might have been used. Modern day magicians like Derren Brown and the duo Penn & Teller have take up the skepticism torch and run with it, often exposing how similar tricks are done here in the 21st century. 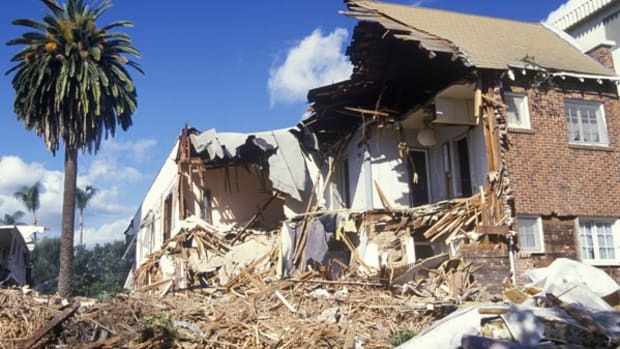 And if you think that your house may indeed be haunted by supernatural spooks, please get your household appliances checked out—ghost sightings (especially in old houses) can often be explained by hallucinations from gas leaks. Happy Halloween!